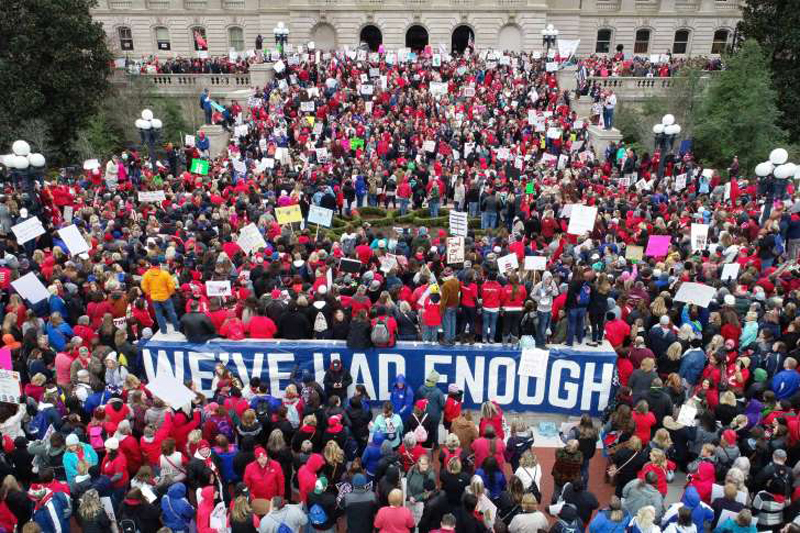 © Alex Slitz/Lexington Herald-Leader, via Associated Press Thousands of teachers rallied for education funding at the state Capitol in Frankfort, Ky., two weeks ago. He later apologized. But his hysterical outburst had deep roots: At the state and local levels, the conservative obsession with tax cuts has forced the G.O.P. into what amounts to a war on education, and in particular a war on schoolteachers. That war is the reason we’ve been seeing teacher strikes in multiple states. And people like Bevin are having a hard time coming to grips with the reality they’ve created. To understand how they got to this point, you need to know what government in America does with your tax dollars. The federal government, as an old line puts it, is basically an insurance company with an army: nondefense spending is dominated by Social Security, Medicare and Medicaid. State and local governments, however, are basically school districts with police departments. Education accounts for more than half the state and local work force; protective services like police and fire departments account for much of the rest. So what happens when hard-line conservatives take over a state, as they did in much of the country after the 2010 Tea Party wave? They almost invariably push through big tax cuts. Usually these tax cuts are sold with the promise that lower taxes will provide a huge boost to the state economy. This promise is, however, never — and I mean never — fulfilled; the right’s continuing belief in the magical payoff from tax cuts represents the triumph of ideology over overwhelming negative evidence. What tax cuts do, instead, is sharply reduce revenue, wreaking havoc with state finances. For a great majority of states are required by law to balance their budgets. This means that when tax receipts plunge, the conservatives running many states can’t do what Trump and his allies in Congress are doing at the federal level — simply let the budget deficit balloon. Instead, they have to cut spending. And given the centrality of education to state and local budgets, that puts schoolteachers in the cross hairs. How, after all, can governments save money on education? They can reduce the number of teachers, but that means larger class sizes, which will outrage parents. They can and have cut programs for students with special needs, but cruelty aside, that can only save a bit of money at the margin. The same is true of cost-saving measures like neglecting school maintenance and scrimping on school supplies to the point that many teachers end up supplementing inadequate school budgets out of their own pockets. So what conservative state governments have mainly done is squeeze teachers themselves. Now, teaching kids was never a way to get rich. However, being a schoolteacher used to put you solidly in the middle class, with a decent income and benefits. In much of the country, however, that is no longer true. At the national level, earnings of public-school teachers have fallen behind inflation since the mid-1990s, and have fallen even more behind the earnings of comparable workers. At this point, teachers earn 23 percent less than other college graduates. But this national average is a bit deceptive: Teacher pay is actually up in some big states like New York and California, but it’s way down in a number of right-leaning states. Meanwhile, teachers’ benefits are also getting worse. In particular, teachers are having to pay a rising share of their health insurance premiums, a severe burden when their real earnings are declining at the same time. So we’re left with a nation in which teachers, the people we count on to prepare our children for the future, are starting to feel like members of the working poor, unable to make ends meet unless they take second jobs. And they can’t take it anymore. Which brings us back to Bevin’s unhinged outburst. One way to think about what’s currently happening in a number of states is that the anti-Obama backlash, combined with the growing tribalism of American politics, delivered a number of state governments into the hands of extreme right-wing ideologues. These ideologues really believed that they could usher in a low-tax, small-government, libertarian utopia. Predictably, they couldn’t. For a while they were able to evade some of the consequences of their failure by pushing the costs off onto public sector employees, especially schoolteachers. But that strategy has reached its limits. Now what? Well, some Republicans have actually proved willing to learn from experience, reverse tax cuts and restore education funding. But all too many are responding the way Bevin did: Instead of admitting, even implicitly, that they were wrong, they’re lashing out, in increasingly unhinged ways, at the victims of their policies.